Most Americans are ignorant of policy issues. Two-thirds can’t name a single Supreme Court Justice, only 37 percent of young Americans can’t find Iraq on a map, one-third believes President Obama is a Muslim, and (as of 1999) 20 percent still think the sun revolves around the Earth. Despite their lack of knowledge, Americans will answer questions related to things they know nothing about. Last year, 39 percent had an opinion about a completely imaginary budget plan. Which is where “deliberative polling” comes in. It’s a social-statistical process of educating a randomly selected group of citizens in an attempt to understand what Americans would think about an issue. And we’re going to be testing it out here on TechCrunch. We’re going to be the media partner on a $165,000 Knight Foundation grant to business consulting firm, Refram It, which will develop a new method of deliberative polling for media organizations.The godfather of deliberative polling, Stanford Professor James Fishkin, will be helping us adapt the procedure (note: TechCrunch is not the recipient of the grant, it is the media partner. Reframe it is the recipient). Specifically, Fishkin and Reframe It, a company co-founded by his son, Bobby Fishkin, will conduct two deliberative polls related to a few technology policy issues, including immigration reform and the National Security Agency. Over the next few months, we will publish stories about the process of deliberative polling and (hopefully) release the first results later this fall. The Knight money will go toward paying citizens to take time to learn about issues from a panel of experts and deliberate with their peers. 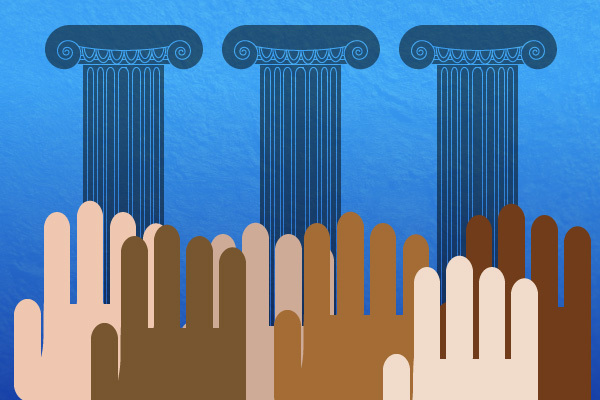 Refram It, Professor Fishkin, and the Center for the Greater Good will conduct a deliberative poll based on TechCrunch’s audience to discuss issues related to technology policy. We will invite TechCrunch’s community to engage in the poll itself and the discussion. Polls are important, however, because we can’t just follow the beliefs of expert insiders. Experts often come from privileged backgrounds and therefore cannot be responsible to speak for the populace in a representative democracy. Deliberative polls give us the advantage of expertise and representation by educating a randomly selected group of ordinary citizens. Second, deliberative polls illustrate how education shifts popular belief. As a media organization, TechCrunch finds this benefit most valuable. Ordinary citizens could be valuable spokespeople for certain policies, especially if they changed their minds. Imagine a die-hard Tea Partier who becomes supportive of Obamacare after a deliberation (or a peacenik that becomes supportive of Syrian military intervention). These citizens would make fantastic interviewees or columnists. We’re very excited to develop a new type of polling for media organizations that can give more voice to informed minds. We’re still figuring out details and will have more information soon. If you’re in the press and have questions, contact me: gregf[at]techcrunch[dot]com. More details about Reframe It’s methodology can be found here and the Knight Foundation blog post here.